Because children grow and develop at their own pace, we have two wonderful toddler rooms that are equipped to enable each child to grow as a whole child in his or her own time. We understand that children develop at all different rates, so we created our transition room for just that reason. 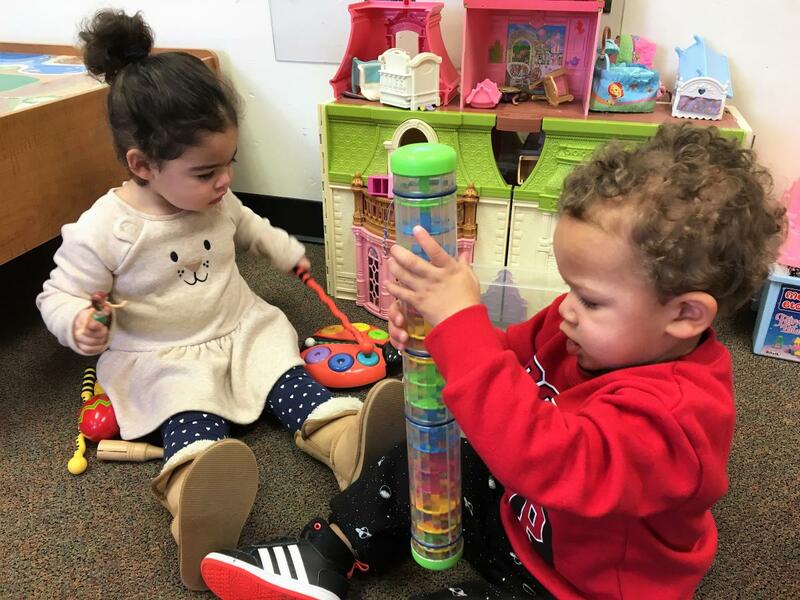 Whether you have an infant that has hit the ground running at 12 months and is ready for more adventure, or a cuddle bug that needs to spend just a little extra time in our loving infant room, our program has the right fit for each child. More than any other room, the Transition Room is a place of change. Cots are used for naps instead of the crib and pacifiers are used at a minimum, usually just at naptime. Your child will enjoy snacks and meals while sitting at the table, and we encourage the use of a spoon for self-feeding. Our room is filled with fun activities! Climbers, slides and stepper/row boats promote gross motor skills. In addition, we play in tunnels, playhouses and on mats. Outdoor activities are included in our daily routine year-round as well. Infants and toddlers learn through play. More than anything, we have fun while learning at Little Angels! We use puzzles, building blocks and a host of other manipulative toys that promote fine motor skills. Daily arts and crafts activities allow for your child’s creative nature to blossom as well. Your child’s verbal skills are encouraged to develop by the use of books, pictures, songs, and through the teachers simply speaking, playing and singing with the children. Be assured that your child’s emotional needs will be met through lots of hugs, smiles, positive reinforcement and comforting! When you walk into our Toddler Room, you see an environment that is arranged to encourage exploration and development. Our teachers work to build a relationship with your child that encourages awareness and self-esteem. Our toddler environment allows children to participate in group and individual play. It encourages children to explore, have choices whenever possible, and to be introduced to social guidelines. Children are encouraged to develop large motor skills through indoor activities and outdoor play. Development of small motor skills is encouraged through finger plays, painting coloring, and developmentally appropriate toys. Self-help skills such as washing hands, using the bathroom and dressing are introduced. Children are exposed to colors, number, shapes, and letters through a modified circle time. Children are encouraged to speak in two or three-word sentences, identify body parts, match colors and names and recognize shapes, and names of their peers. We as teachers understand that toddlers are testing the environment, developing bonds with other children, and seeking independence. Our activities provide an opportunity for your child to grow and learn while having fun and feeling safe and secure.